Jonathan Stroud’s ‘Bartimaeus Trilogy’ was so good and so successful that it was with some trepidation that I started his new book, Heroes Of The Valley. I needn’t have worried though, While it is a totally new direction and a different type of tale to what you might expect, it’s not long before Stroud’s deft story-telling pulls you right in, proving that the cream will always rise to the top. Halli is a young boy and second Son of Arnkel, Arbiter of the House of Svein – the greatest house in all the valley, or so Halli believes. Halli is a daydreamer and a prankster. He loves the tales his uncle recounts of Svein the hero and longs to escape the boredom of ordinary domestic life and leave the house for adventures of his own. The trouble is, as Arnkel’s son he has a duty to the House and responsibilities to the people who work the land and pay tithe, but as second son, he will always play second fiddle to Brodir, his older brother. Halli’s world is turned upside down when he witnesses the murder of his uncle and, unsatisfied with the thought of a Council hearing and award of a few acres of land for the crime, he sets out alone to the House of Hakon to avenge his uncles death. But, bound to a quest of his own, nothing goes quite as smoothly for Halli as he expected and when he eventually finds himself back home, the wrath of those against whom he sought revenge has followed him, seeking to end this feud once and for all. Halli must now challenge everything he ever believed in, take responsibility for his deeds and discover the truth about the legends, the valley and what makes a real hero. Heroes Of The Valley is a beautifully crafted tale crackling with drama, excitement and wry humour. Reminiscent of old Norse sagas, it has the feel of a traditional heroic fantasy tale but very quickly takes the standard fantasy tropes and turns them on their head, even Halli is not the typical hero, being short and dumpy with little legs. The pacing is excellent, easing you into the story at first and then pulling you along faster and faster as it builds to a terrific and surprising climax. For those familiar with The Bartimaeus Trilogy, this is a much simpler story, certainly the plot is far less complex, but I think it deals with much deeper and more important issues within the themes of identity, the nature of heroism and the continual eulogising of the past, the impact of violence – not just on the victims but on the aggressors – and the nature of role models within families and within communities. Stroud also pulls off a neat trick in the structure; each chapter opens with an extract from the legends that make up Svein’s Tale and these extracts get more and more outlandish and more far-fetched as the book progresses but, in doing so, they act as a nice counterpoint to Halli’s own larger-than-life tale where the truth rarely gets in the way of a good story. 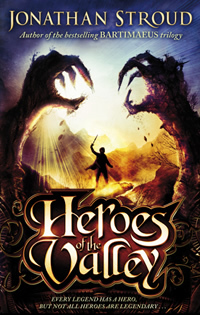 Heroes Of The valley is a terrific read, engaging, well-paced, with memorable characters and a twist in the tale, and while the ending is open enough for further adventures, it is also that rarest of things, a standalone fantasy novel. Once again Jonathan Stroud has proved he can craft a novel that will appeal across the board. SCI-FI-LONDON was lucky enough to catch up with Jonathan Stroud to talk about writing Heroes Of The Valley and you can watch that interview by clicking here. Heroes of the Valley is published by Doubleday through Random House and is available from Amazon , Blackwell and all good book stores. Jonathan Stroud has a website you can visit here.